Reading progress update: I've read 35%. 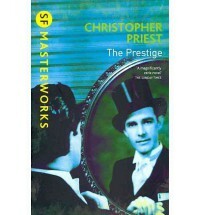 I've been looking for an engaging work of fiction that I could sink into for a few days and then, without knowing much about it, picked up The Prestige, mostly because I liked the cover. Now I'm not only hooked to the story but it also turns out that this is perfect book to end the Halloween theme with. And I am absolutely loving how the events and characters not only seem to relate to events in John Anderson's life (i.e. The Great Wizard of the North) but that he was also included briefly as a character.